Alberto Giacometti was born in Switzerland and became a student of the arts early in life. He travelled to Paris in his early twenties and became a painter, sculptor and printmaker. Throughout his life and work he focused on three core themes, standing women, busts and a man in movement. He experimented with surrealism and cubism and kept a riotously colourful list of acquaintances and contemporaries including Picasso and Mir&oacute;. <br /><br />Giacometti was in many ways the perfect subject for a study on the creative process. He was bohemian but still driven. James Lord, an author and his biographer, agreed to sit for a portrait by the artist and this book is the result of his recording of those days. 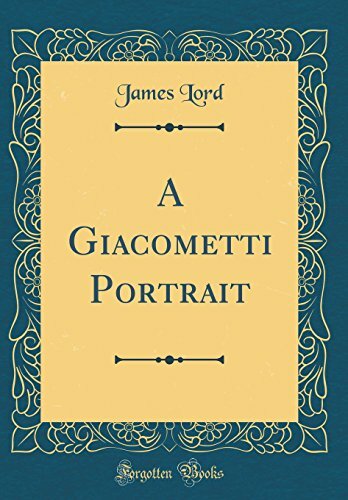 He did not merely experience the day to day activity in the studio or Giacometti's many idiosyncrasies, Lord recorded the artist's emotional state and the tribulations and distractions that occurred over the 18 days of sitting. Lord shows us a man who seems irritable but warm, engaging but absorbed in his work. <br /><br />'Giacometti's Portrait' details Alberto's fixation on his younger brother as a model for his work, his messy surroundings and the cigarette ash dropping to the floor as he became distracted. Creatives of all kinds will appreciate the reliance of Giacometti on the ritual and instinctive in striving to create a meaningful work of art. The two eggs the artist needed to eat, the two glasses of beaujolais and the two cups of coffee that were required are familiar to all of us from the student writing an essay to the artist creating a masterpiece. The earthly fortifications that surround the creation of art which is supposed to transcend them remain fascinating.<br /><br />About the Publisher<br /><br />Forgotten Books publishes hundreds of thousands of rare and classic books. Find more at www.forgottenbooks.com<br /><br />This book is a reproduction of an important historical work. Forgotten Books uses state-of-the-art technology to digitally reconstruct the work, preserving the original format whilst repairing imperfections present in the aged copy. In rare cases, an imperfection in the original, such as a blemish or missing page, may be replicated in our edition. We do, however, repair the vast majority of imperfections successfully; any imperfections that remain are intentionally left to preserve the state of such historical works.